This whipped cream cheese frosting is the perfect cream cheese frosting for piping. So easy to make, you’ll want to use this sugar-free frosting on all of your low carb cakes and cupcakes. You’ll love it. Cream cheese frosting is the classic choice for red velvet cakes and the best frosting for carrot cakes. It’s tangy-sweet flavor pairs well with many desserts, but it’s often over-sweetened and its texture a little runny. I remember my mother’s cream cheese frosting being so sweet it actually hurt my teeth! Some people don’t care for cream cheese frosting – they don’t like the tang. 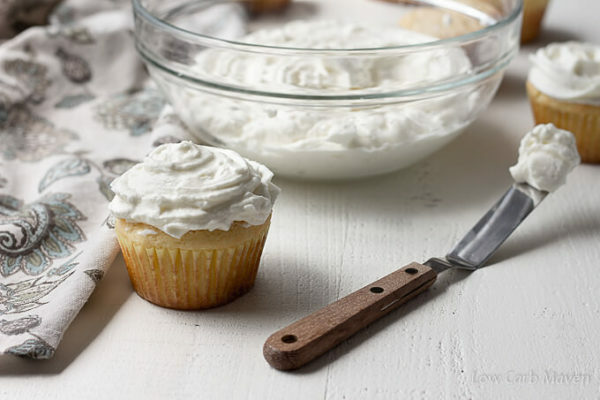 If that’s you, my classic sugar-free cream cheese frosting recipe tames the tanginess by whipping the cream cheese with butter, resulting in a silky-smooth texture. 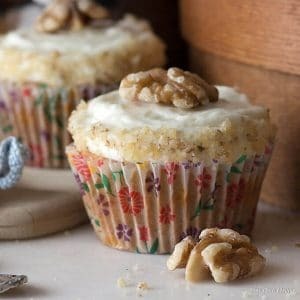 It’s perfect on carrot cake cupcakes or these vanilla buttermilk cupcakes. Yum! 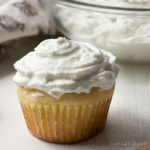 There are really two ways to make this delicious and fluffy cream cheese frosting: a two bowl method and a one bowl method. Two bowl method: Whip the cream cheese and sweetener in one bowl and the heavy cream in another. Then, fold the whipped cream into the whipped cream cheese. I have used this method a lot. But, I thought I would try whipping them together the other day and it worked perfectly! 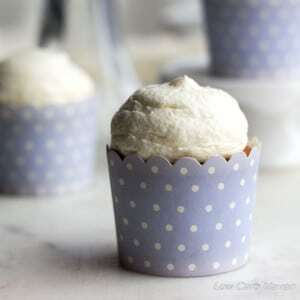 This sugar-free whipped cream cheese frosting recipe whips cold cream cheese with cold heavy cream to create the perfect piping texture. And, it’s stable enough to stand up at room temperature. If you enjoy baking cakes and cupcakes then having a frosting that can be piped is a must – this is it. It’s also a great filling for whoopie pies or frozen as a great low carb keto treat. 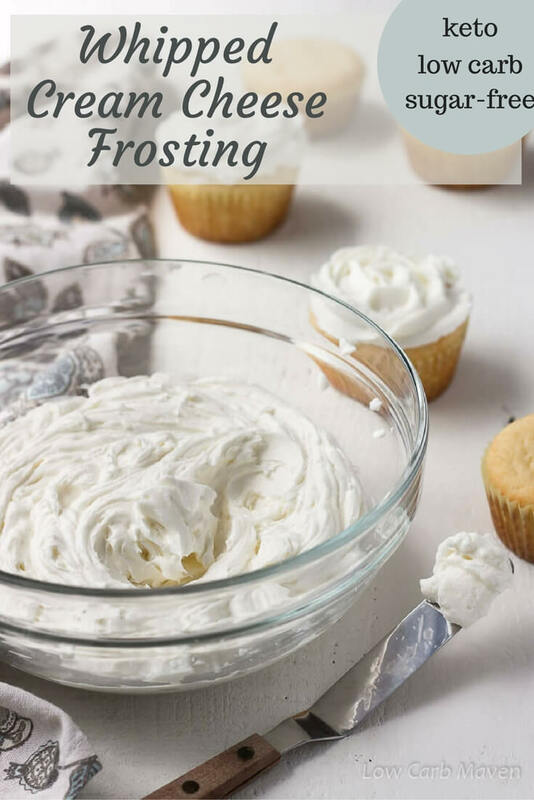 Whipped cream cheese frosting is amazing and easy to make! I use a hand mixer to whip it but a stand mixer works even better because it whips faster. I generally don’t use my stand mixer because I constantly need to turn it off to scrape down the sides – boring! I have a big Artisan stand mixer (a relic from my bread making days) but I saw a smaller Kitchenaid mini stand mixer in Target the other day. Perhaps it works better? In any case, the recipe is very easy and either style mixer can be used. 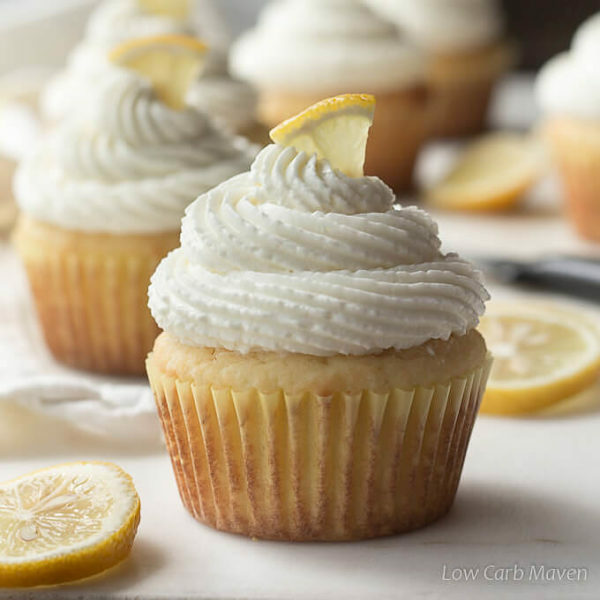 By the way, I used this great sugar free frosting on that low carb lemon cupcake above. The cupcakes were great! 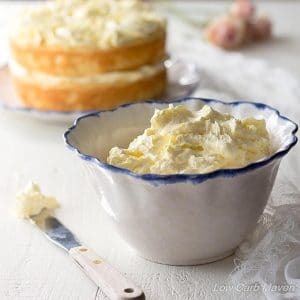 If you are new to low carb you may be wondering how to make cream cheese frosting without sugar? It’s easy. I use a natural low carb sugar alternative like an erythritol/stevia blend in place of the sugar. I like Sukrin Icing Sugar but Swerve Confectioners is another popular brand. This Sugar-free Whipped Cream Cheese Frosting is 1 carb per 1/4 cup serving. How to powder granulated sweetener: Place 1/3 cup of granulated sweetener (erythritol, xylitol, Sukrin :1 or Swerve Granulated) into a coffee grinder and grind for 10 seconds. Yields 1/2 cup of powdered sweetener. NOTE: If using plain erythritol or xylitol you may want to add a little stevia glycerite or liquid stevia to the recipe to bump up the sweetness. Whip the cold cream cheese until loosened. Add the Sukrin Icing Sugar and vanilla, whipping until incorporated and smooth. Adding the heavy cream 1/4 cup at a time, slowly incorporate the liquid into the cream cheese and then whip until light and fluffy. It will still be somewhat stiff since the sugar alcohol keeps it cold. Spoon into a piping bag (or ziploc bag fitted with a tip) and pipe onto cupcakes or cake. How would I make a chocolate version? adding cocoa powder and how much do you think? WOW – I am stoked over how this turned out!!!! It is the -perfect- recipe I’ve been looking for. I have a lot left over…any idea of how this freezes?? Thank you. I love your work! Hi, can I use regular erythritol granulated sugar instead of confectioners sugar? Thanks!! How does it hold up while the cake is sitting out room temp at a party? I’m planning on using this frosting for a cake this weekend and I have to travel an hour in the car with it. I thought about just frosting it when I get there but if I do it at home the. I can pipe on flowers and stuff with regular buttercream. I just don’t know how it travels. This frosting came out beautifully!! Tastes amazing too…thanks so much for sharing!! How would you make it coconut flavor? I have tried a couple of recipes and they were awful, they taste terrible…Don’t know what I am doing wrong. I am using Swerve Confectioners Sugar…I love coconut cake with a coconut Cream Cheese icing…Looking forward to trying yours! Absolutely awesome recipe. My whole family loves it, and they even know it’s sugar free and my kids always scoff at sugar free. Has anyone ever made it chocolate? This recipe comes out gross and chunky using cold cream cheese. It works much better with it softened. This is an excellent recipe! We love it! I did scoop the majority of this using my smallest cookie scoop to freeze. Will need to have these always on hand. I did use all the same ingedients as the recipe called for, but different brands. Pyure sweetener, and just the Walmart brand of heavy cream. So my macros were slightly different. Thanks so much for the recipe. BEST. CREAM CHEESE FROSTING. EVER!!!!! I’m a huge cream cheese fan, and this frosting is perfect. Thank you!